AIS is always looking for people around campus with interesting stories. Most of them are hard-working students, teachers, or staff-members; because they are all so busy most of the time, you do not see them that often. "As this semester quickly closes, I'm spending my time reminiscing on my fun memories in Tulsa. I'm sad to leave so many great friends and events, but I'm excited for an entire semester of firsts in Galway, Ireland! See you in August, T-Town!" 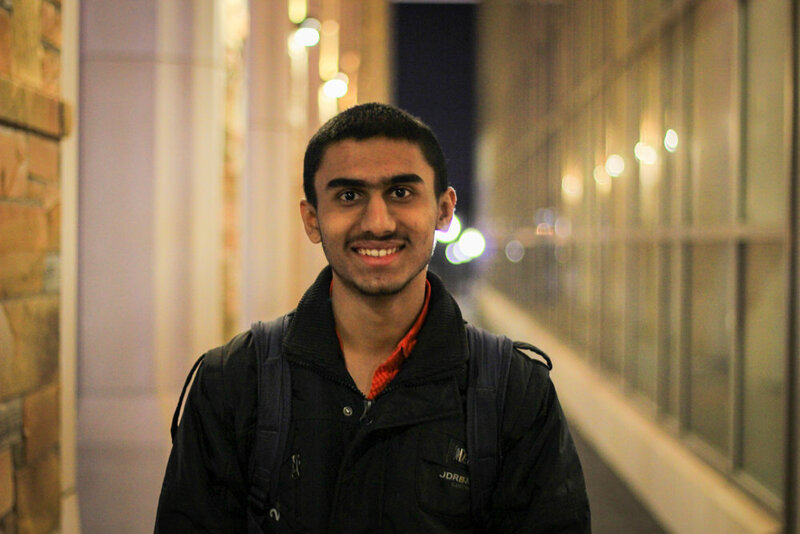 "Finals can be really stressful but I unwind by going to local coffee shops with friends, and watching The Office and Stranger Things on Netflix." Blake and Gui have been roommates since the beginning of the semester, and have been friends since they first arrived at TU. Gui: "On the first day after summer break, I went to my car which I had left here at TU over the summer. But the car wouldn’t turn on. Blake came to help me figure out what was going on. We opened the hood, looked inside, and realized that we didn’t know anything about cars. I looked at Blake and he was confused, and I was even more confused and so I started to stress but Blake was actually more stressed than me! Blake: "... and he bought the biggest, most expensive bottle! He literally walked into the store and asked, "Give me the best!" We left the store with this huge, heavy oil bottle. Gui: "But when we got to the car, we realized we didn’t have a funnel! So I poured the oil from this huge bottle into the car, and it splashed out everywhere! Also, the car had no gas, so we had to go and buy it as well. And still the car wouldn’t turn on. We called Campo and they helped us jumpstart the car. The whole thing took a good 4 or 5 hours. I was very glad to have someone like Blake to help me throughout this whole situation". Gui (about Blake): "He is very nice and he is very down to earth. He will tell you what he is thinking; he doesn’t lie. He is a very straight-up guy, if you ask him for an opinion; he will tell you the truth with no covers, and I really admire that. He is also a very intelligent guy." Blake (about Guilherme): "Gui is one of the most polite people I’ve ever met. For example, he has early classes, and I've late classes, so he goes to sleep before I do. At night, he would still leave the lights on in the room, so that I can study. In the morning, when he wakes up, he is very quiet, and makes sure not to wake me up when he leaves. He is a very kind guy." "What do you miss about Japan?" Do I miss anything else? Oh, yeah, and my family, too!" "Why do you miss particularly the food?" "Food is here are also good but I still miss the Asian way of cooking. I'm looking forward to the authentic Asian food at the International Night Market this Friday!" Sebastian tells us about difficulties on his very first days at TU. "On my first or second day here in the U.S., I went with my friend to a grocery store to buy some milk. It was already dark outside but still very hot on that evening. After my friend dropped me off, I tried to get into my apartment but my key just didn't work! At that time, I didn't have Campus Security's number, but I had been told that, if I had a problem, I should push the button on those big blue emergency phones. I didn’t know what would happen if I would because I thought of bright lights and loud, noisy sirens going on! And, as I said, it was already night, I didn’t want to wake up everybody. However, the milk was 'in danger' because it was getting warmer and warmer. So I went to another blue tower, away from my apartment, so all my new neighbors wouldn’t see me as this crazy guy wandering around with a gallon of milk in his hands but a different neighborhood. Finally, I pushed the button and fortunately, no loud siren sounded. Instead, a nice campus police lady answered, and she first thought that I had lost my key in the apartment, but that wasn't the case, of course; I was just unable to open the door! Five minutes later, Campo arrived and the man said, "Try it again...". I did, but it still wasn't working. He tried it with my key - and opened the door right away! It turned out that for the second door lock you have to turn the key in the opposite direction of what I thought (because usually, that works at any door). So, now the whole campus security team probably knows me as 'that German exchange student who cannot even open a door! ', I guess." If you have an interesting story to share, contact us at [evan.ng@utulsa.edu]!